I don’t remember how many days we don’t have a sunny day. In summer I check the weather forcast many times everyday. Yesterday’s weather forcast said, it will be sunny. But actually I didn’t trust it because the weather change day and day. However, we got a sunshine today in Shirahama, Shimoda. 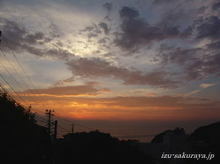 This entry was posted in beach on 2007年7月24日 by izusakuraya. Many parasols on Shirahama beach!! Today it was a last day of these 3 holidays. It was cloudy all day today, but we could see many parasols on the beach. The typhoon is still making the wave strong. That’s why there were a lot of surfers in Shirahama. This entry was posted in beach on 2007年7月16日 by izusakuraya. The typhoon #4 is coming to Japan now. That’t why we had strong and big waves here in Shirahama. 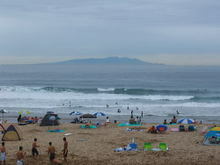 Yes, it was very good condition for surfing. If the typhoon come to Shimoda directly it gives higher waves for surfers. This entry was posted in beach, nature on 2007年7月13日 by izusakuraya. What do you think these two pictures taken in Shimoda? When I was posting a lot of pictures in our website it was started to be bright outside and the birds started to sing a song. "Wao! It is already 4:00 in the morning!!" When I opened the window the sky in the east was almost red. So I took this picture from the window of the guest room on 2nd floor….. This entry was posted in nature on 2007年7月3日 by izusakuraya. 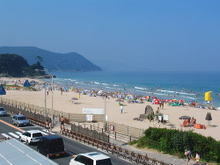 When I go to Shimoda I sometimes take pictures of the beach before shopping. And my son has to wait for me until I finish to take pictures, but he is good guy because he doesn’t cry. I guess he understands his situation since he always has to wait while I take pictures. Anyway I am showing the picture which I took today…. This entry was posted in beach, Family on 2007年7月1日 by izusakuraya.